Saul realized that his troops were rapidly slipping away… (1 Samuel 13:8). The men of Israel saw what a tight spot they were in; and because they were hard pressed by the enemy, they tried to hide in caves, thickets, rocks, holes, and cisterns. Some of them crossed the Jordan River and escaped into the land of Gad and Gilead. Meanwhile, Saul stayed at Gilgal, and his men were trembling with fear. Saul waited there seven days for Samuel, as Samuel had instructed him earlier, but Samuel still didn’t come. Saul realized that his troops were rapidly slipping away. So he demanded, “Bring me the burnt offering and the peace offerings!” And Saul sacrificed the burnt offering himself. Saul stayed … Saul waited … and as a result, Saul sinned. Saul ended up being inappropriately reactive, and thus committing a sin. His reaction to his men slipping away, hiding, and defecting was to act in a way that was inappropriate for anyone but the priest. It’s been said that action has killed its thousands, and reaction has killed its tens of thousands. But if only Saul would have proactively sought God, or proactively formed a battle strategy, or proactively spoke an encouraging word to his men, or proactively moved out with his troops—anything(!) but just sit still—perhaps his legacy as king wouldn’t have been so short lived. When leaders aren’t appropriately proactive, they risk becoming inappropriately reactive. 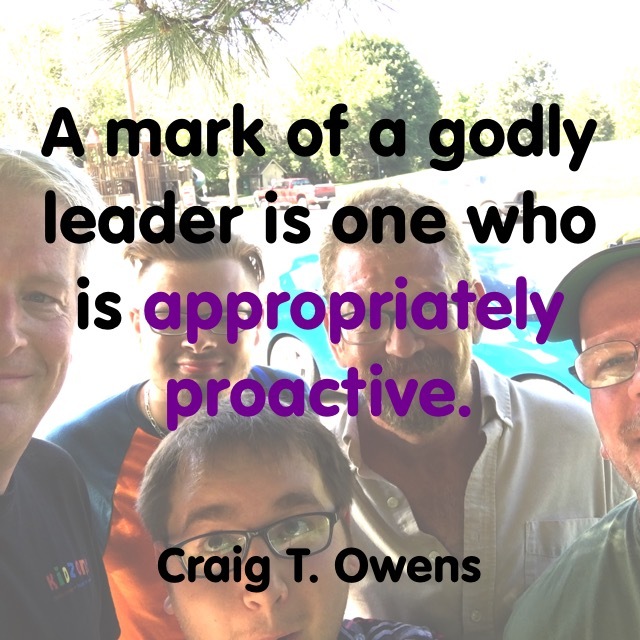 A mark of a godly leader is one who is appropriately proactive. This is part 20 in my series on godly leadership. You can check out all of my posts on this topic by clicking here.